The shoulder pad and two rubberized handgrips can be adjusted in nearly any configuration along the included handlebar rods and 18" carbon fiber support rods. And with the addition of a Redrock microMount (not included), the rods can be used to support a host of accessories, from articulating arms to external monitors, batteries and portable hard drives. Generally this system requires at least one additional component: a rod clamp or a microMount with spud for external monitoring. The microShoulderMount can be adapted to just about any style of shooting or camera. 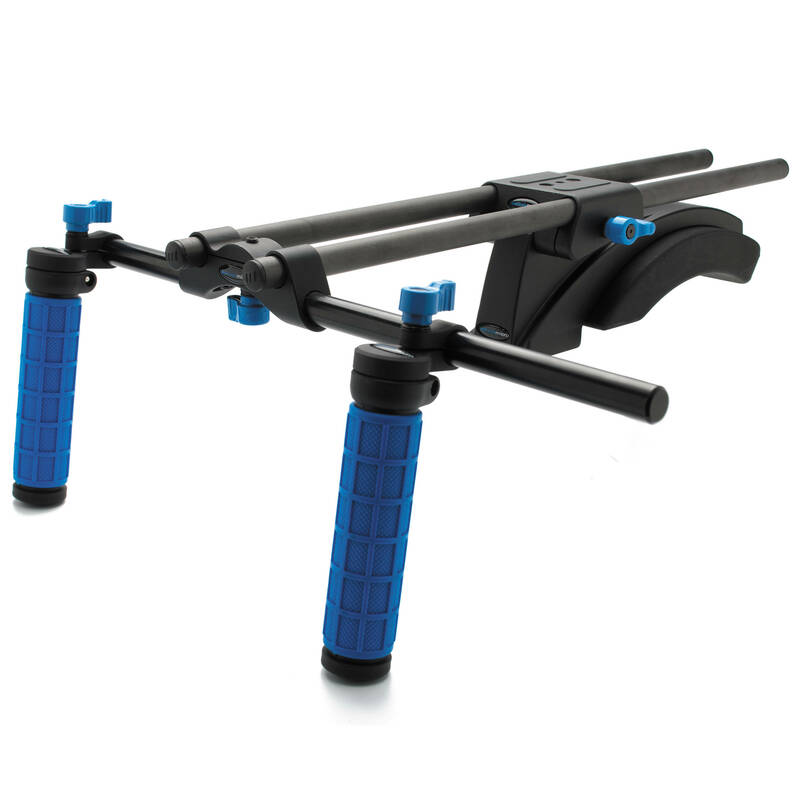 The handgrips and shoulder pad can be integrated onto your existing 15mm rod system for a compact setup. For maximum flexibility, the microShoulderMount can be run on a separate set of rods (not included) beneath your rig for quick attachment or removal of the shoulder mount support. For ENG style cameras with an integrated shoulder pad, the handlebar, grips, and rod clamp can be attached directly to the camera while using the camera's own shoulder pad. And for setups requiring precise balancing, use a separate rod clamp (not included) from the one that's connected to the shoulder pad, so the camera and shoulder pad can be moved independently on the rods. Optional microMount connector with 1/4"-20 male/female tap can be used to mount on-camera LCD monitor, articulating arm, or other accessories. The microMount can also be positioned on any 15mm rod anywhere on your rig for added flexibility. Box Dimensions (LxWxH) 18.25 x 8.5 x 4.6"
microShoulderMount Deluxe Bundle is rated 4.3 out of 5 by 37. Rated 3 out of 5 by Oliver from Good quality at a price If the prices for these things weren't so high this would be a five star product. Once you figure out what all the complicated little parts are that you need (even if you're buying a bundle) you'll be spending a lot of money. Be careful with this item as it is sometimes ... represented as including two micro clamps. You only get one. The other one is not cheap if you can even get it. The manufacturer will tell you it'll only take a 3-4 months to fulfill your order for the part that's not included (but is currently in the photograph). They may not apologize. Who do they think they are? Other than that, it is well made. Rated 4 out of 5 by Alana da Silva from Great Stability, Reasonable Price I used this to shoot a short film over two days, and I must say that I found very little to complain about. The most common problem I find when shooting with a DSLR is the appearance of micro-vibrations in the footage when shooting hand-held. This device eliminates those micro vibrations almost completely (depending also on the camera operator of course), and allows you to adjust focus mid-shot with reasonable ease. The only thing that is missing from this, and which should almost be included is a weight plate. Even one weight would make it more balanced, and make a difference in how much energy is spent on balancing the rig on your shoulder. Also, this will help when shifting grip from two to one hand, taking out at least some of the wobble. Otherwise, I use this at work, as well as for my own projects and think its a wonderful, functional, good-looking product. Rated 5 out of 5 by Gillmantech from Great Shoulder Mount I bought this mount for use with my NEX-FS100 and it has made run and gun shooting so much easier. The mount is made from quality materials and the shoulder pad I find to be rather comfortable to use. I'm hoping to someday buy a couple accessories for it, such as a follow focus kit and some counter balance weights, but as with all video equipment the costs can be somewhat prohibitive; so for now I am content. I will be shooting a music video and some street interviews in the coming months and I know it will be of great benefit to those projects. As one last note, if you use the NEX-FS100's steadyshot feature with this mount, it makes a world of difference. Rated 1 out of 5 by Ethan from Price Increase, Less Hardware I bought one of these in December 2009 and it was $395 and included two of the micro clamps. Now it is $ and only includes one micro clamp. So it is actually over $650 if you want the configuration shown in the image above. It is a good support, but Redrock has raised the prices drastically while providing less hardware. The extra clamp allows you to mount a camera in the middle while keeping the shoulder mount positioned in the back. Rated 3 out of 5 by USC Grad Student from Essential product, poorly designed I use this rig for my Canon 7D. It's really hard to get a smooth hand held image without one of these rigs (not necessarily Redrock). However, this company makes some very innovative products for the DSLR craze. Products that make your camera work easier and look better. And it becomes hard to stray away from the Redrock Micro line of camera gear. I was really excited when I got my rig, then really disappointed to find out that the rod clamp was easily stripped when I tried to screw the blue nobs in. It didn't feel like it should fit in the screw, but I turned the nob anyway. Then it wouldn't tighten. Turns out the thing was defective. I had to send the product back, which ended up being a 50 day ordeal. And the shipping/repair department at Redrock would RARELY get back to my numerous emails and phone calls wondering where my product was. It was infuriating. BE CAREFUL WHEN BUYING THIS PRODUCT! Rated 1 out of 5 by CaliShooter from Quite possibly the worst shoulder rig The tripod mount makes no sense, and is weak and just all wrong. This shoulder rig was designed very, very poorly. Yes you can use this to mount your cameras on to, but you will spend a lot of valuable time making things right. The handles are weak and slip. Really can't believe people review this thing with high regards. Maybe this is the only rig they've ever used. Invest your money in equipment that functions well and doesn't snap or strip bolts/threads. Rated 5 out of 5 by Anonymous from Built Strong and Customizable I bought this as a more cost-effective stabilization device for my Canon 7D (I will also be using whenever I do handheld with the Panasonic HVX 200). It works with so many other cameras as well so it seemed a perfect device that I could also use when I upgrade my camera in the future. It's built so well I can't imagine it breaking anytime soon and it's very customizable for upgrades or other accessories. The online training videos on how to put it together are very helpful too. Rated 5 out of 5 by Aphi from Great, but missing essential DSLR piece Redrock makes wonderful camera rigging equipment. The only problem with this bundle is that it's missing an essential piece to support all of the claims in the info. You need a Redrock DSLR Baseplate, which at this time is another $, to actually mount a DSLR. The people from Redrock claim that this rig isn't for DSLRs, and that is made apparent once you order and have no way of attaching your DSLR camera. However, with the additional piece, it works great and is still cheaper than the rigs that they claim are made for the DSLRs. Can this one be used for the FS7M2 and Sachtler FSB-8T head? Yes, you can use this with the FS7M2 and a Sachtler FSB-8T. You may wish to add a flat base plate so you can lower the center of gravity. As is, the bottom of the shoulder rest is where you attach the video head quick release plate. This raises the camera a few inches and that could be an issue.